Excuse my ignorance but what quality of bike is a Bob Jackson and what is the companies history. I saw one and wondered about it as to whether it was a good bike or not. One of the best Brit brand names. Built singles/tandems. They're not good, but great bikes! From what ive read, one of the finest British bikes available. All hand made i believe. started in 1935, still in business. being a bigger production shop (not a one man show) quality control has been rumored to be up & down throughout the years..
Last edited by coelcanth; 10-17-07 at 08:54 PM. Bob Jackson also built Merlins after acquiring the name from previously London-based builder. Can't wait to try mine out on the road...but it will have to wait. Yeah, they had some years where quality suffered, but most of the BJs you will find are Great Brit Bikes. Recently? (I know, probably not). 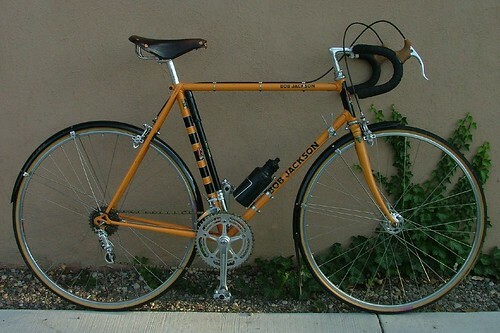 Some seller had a Super Tourist with a modern Campy Triple group on ebay for $500 opening bid, $1000 BIN, then he listed it locally on CL for $250 (concurrently reduced starting bid to $250 on ebay). It was gone the same day, despite my efforts with help from a BF local to the bike. The seller's desperation to sell was a bit of a red flag. I've seen excellent examples and mediocre examples on eBay. Seem to be very good bikes overall. Given my choice I'd prefer a Mercian, but Jackson' are good, too. I've enjoyed riding the one I picked up last winter (thanks again for the hot tip jgedwa ), but I'm reasonably certain mine will be up for auction after I get its likely replacement built up. It was built as a racing bike, and I'm about 20 years past the point where I could seriously consider racing. Were it not for the scratches that a less careful previous owner allowed it to sustain, the finish is very, very nice. The bike handles beautifully. I can take lines on corners that many of the racers in my club on modern bikes struggle with. I'm a bit partial - but my 1973 Bob Jackson is one of the nicest bikes I've ever had. It has beautiful prugnat 55 lugs, is light for a large frame (63cm), and is very well built. It was custom ordered and sold through Gus Betat in New Orleans. Very sweet. I ride a 1982 BJ 531C frameset which I bought a few years ago in mint (i.e. never built) condition and built up with Campag period pieces etc. It is an absolutely stunning looking bike with superb paintwork - a mint green with off-white coloured script, lugs picked out in the same colour and silver-grey banding - lined with off-white on the seat-tube, in the centre of which is the red BJ crest. The same crest is on the headtube on a silver-grey background. I have it built up with mudguards and a brown Brooks Pro saddle in a British day-tourer look. The geometry is comfortable - it is not an out and out touring bike, but it is more relaxed than my Ilkeston Raleigh. It is my Spring-Fall ride. I highly recommend the earlier BJs - not sure how present-day versions match-up. Here is mine from around 1973. -- Reynolds 531 with Prugnat lugs. -- Full Nuovo Record. Constructed with many subtle details to ensure stable handling and a frameset with just the right stiffness. A great riding bike! ... And good colors for Halloween too. i'm really really happy with it. have had it a year now. Top quality describes the BJ Touring I found a few years ago. It was baby blue with an ivory head tube & panels, Nervex lugs, full Campagnolo NR. A really a sweet bike. I had a "to small" 45cm Eisentraut frame for trade bait but couldn't close that deal without adding a chunk of cash. After a lot of haggling, I left with a Specialized Expedition Touring. It was a good trade but the Bob Jackson would have been better. have you ever owned a bike and sold it and then several years later wish you had not? my 1974 race competition bj. absolute best lugged steel frame bike i have ever owned. truly a work of art. most people don't know that bj actually made hetchins during the late 70's and early 80's and was the first company to be certified to build 753. the company was sold aned suffered for a number of years and then the bj family bought the company back and has reestblished the quality of old. Much better quality with the paint on than off. So keep the paint on. (I would bet that current production is more consistent than at many points in the marque's past). Last edited by Picchio Special; 03-26-08 at 11:56 AM. You have a Merlin or a BJ? I'm in the same boat with my Merlin. I recently got the proper BB for the Super Record triple, so as soon as that goes on...it hits the road! I have a 1995 BJ Super Tourist. BJ had just taken back control of the brand to sort out all the quality issues that degraded its reputation. I had the first frame he supplied to my local lightweight specialist and it is all well done. The brazing and alignment are good and the paintwork still turns heads today. I got the nod from another BJ owner on my commute a few weeks ago. I have compared it to a Waterford of similar style but have to admit that Waterford finish is crisper and more stylish. The aspect of my BJ that stands out are the wraparound seatstay ends for massive braze area. Rode this frame for at least 20K miles. Totally comfortable, true steering, absorbs road bumps. Have passed it on to the next generation of cyclists now that I'm too old and too busy to ride mega-miles.